Replacement model coming in November. 42939, 32939, 22939, 2939 height adjustable table products are all the same product with different packaging configurations. 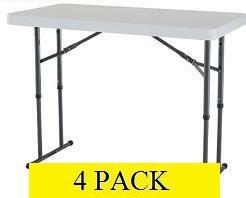 2941, Four Foot Regular Rectangular Indoor/Outdoor Folding Table. Lifetime Folding Tables with Adjustable Legs are manufactured by Lifetime Products. Lifetime folding tables are constructed of high impact polyethylene and are stronger, lighter and more durable than wood. They will not crack, chip or peel, and are built for indoor and outdoor use. 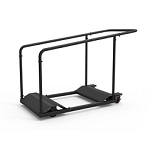 The patented steel frame provides a sturdy foundation and is protected with a powder-coated finish. Lifetime folding tables are manufactured in the USA and backed by a ten-year warranty. These tables are excellent for family, church, social, and business gatherings. This model is a granite white colored table. This table is also identical to model 2939. Each 4 foot Table is approximately 29.5" tall. Lifetime Adjustable Folding Tables are Lightweight. Will Not Crack, Chip or Peel. Stronger and More Durable Than Wood. Great for Thanksgiving, Christmas, New Years Feasts, Camping, Boating, Fishing, Picnics, Sporting Events, Recreational Activities and More! Sturdy Double-Wall Construction Provides a Stronger and More Durable Tabletop. Lifetime Adjustable Height Table Includes Mar-Proof Leg Caps. High Impact Polyethylene Table top. mdhfineart Just what I need. Very solid - well made - as described. Thank you! birdieboy12 Fast shipping and great product. Thanks! kelsea Perfect transaction, fast shipping, I am very satisfied with purchase! 6841williams Very nice product ! very fast delivery ! lucyfind Item as described. Arrived on time and in great shape. Thank you! lt4car AAA+EBAY Seller,fast shipping, packed well, thank you. gorilladude22 Great product, fast shipping, highly recommend! puschkinsdad Just what I wanted. Thanks. jjbzjewelry VERY NICE PRODUCT! SUPER FAST SHIPPING! GREAT SELLER!!!! exlachine Great product.....super fast delivery.....wouldnt hesitate to buy from again!!! dfc8888 Awesome Product - Very Happy! Packaged Carefully! rossomaxa Great product, fast shipping. Thank you! clsmooth555 Love the table, just what I expected, quick ship, thanks! 2tia-rose Very pleased with transaction. Will buy from again!! Thanks!!! evoldneps Smooth transaction. Super fast delivery. Have & will buy from this seller again. griffinstcroix456 Great product - Thanks! angiet10 Just what I wanted - fast shipping - received it in time! Thanks. tremig Great transaction & communication. Buy here with confidence! jes0883 Great table. Just what I wanted. Adjusts in height. mtndreamsjewelry Great Table, very well constructed & just the right size-Thanks!